Today I am going to compare the HTC Titan to the Nokia Lumia 800. The Lumia´s color are more powerful due to the AMOLED technology. Personally, I think the calibration has too much of red in it. This makes me feel the HTC display is more natural in color. Well, let´s go ahead. Typing on Titan is really easy and fast, with nearly no wrong taps on the keyboard. Typing on Lumia is also easy, I was impressed that I was able to use it nearly as fast as the Titan. Both devices have an 8 MP camera. I know that MP is not all, but in a comparison it still has to tell something. Also both devices come with a F2.2 lens. Nokia has the clear advantage of a Carl Zeiss lens on the hardware side. Carl Zeiss is a German manufacturer which is specialized on optical hardware. If you compare the two images, you will recognize that the Lumia´s color are not as powerful as the Titan ones. In my opinion the Titan´s Image looks a little better than the Lumia´s. Both Images are taken with flash. The quality of both cameras is really good for smartphone cameras. So here I will stop with a draw for both devices. As you can see, the Titan has a little better result than the Lumia. The difference is so small, you won´t even check this in daily use. The Titans speaker is on the back, while the Lumia´s is on the bottom of the device. Both speakers have a good sound, while the Lumia´s has a bit weak loudness. The Titan has also a sound optimizer, while the Lumia does not have this. I am sure Nokia will bring any sound optimization in future. For now, plus goes to the Titan. Until now, both devices seem to be a good decision. 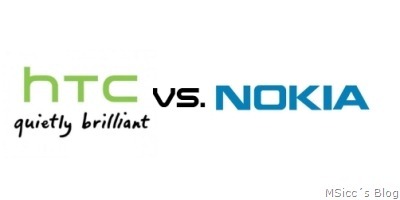 But as OEM´s, both Nokia and HTC are trying to differentiate from others. Nokia has its own Navigation System, Nokia Drive and Nokia Music as well as Nokia Maps (last one will be a paid app on other OEM devices). It has no front camera and no gyroscope. We were told that there is also a Nokia section in the marketplace. Well, at least in Germany with o2-sold devices there is no Nokia section. You have to search the Marketplace manually. HTC has a own Marketplace section, with tools and gadgets you will find useful (for example a torch-app). The Titan also has a front camera for video calls as well as a gyroscope. Both devices are really good smartphones. If you want to have a good, well priced device, I recommend for sure the Nokia Lumia 800. As I am an enthusiastic user and also developer, my decision is the HTC Titan. You will get an future secure device, which has all possibilities a modern smartphone needs. Thanks for your attention and feel free to leave a comment below.